Villagers held by the US Army in 1966. The regimes in Saigon that followed Diem were many, and they were led by military men. An attempt was made at elections, but not one of the generals was able to rule democratically. Their regimes had some civilian supporters, but none represented the feelings of a broad segment of the population of South Vietnam. These were regimes that owed their existence to US support. They had their fervent followers, but they needed more public support. The National Liberation Front, on the other hand, had the support from local populations without which it could not have gotten by. Moreover, to the US ambassador to South Vietnam the Communists appeared to be on the verge of overwhelming the Saigon's forces. The ambassador sent a note to Lyndon Johnson as soon as Johnson became president, and it told the president that he faced a hard choice: either dramatically increase US involvement in the war or see a Communist victory there. In private Johnson said that he was not going to be the first US president to lose a war, and he didn't want to offend anti-Communists in Congress whose help he wanted in getting civil rights legislation passed. On 31 July 1964 in the Tonkin Gulf, the US Navy was helping South Vietnam make raids against a North Vietnamese radio transmitter on the island of Hon Ngu. The North Vietnamese responded by sending out torpedo boats, and as they approached the US destroyer, Maddox, two of the torpedo boats were sunk and a third damaged. On August 3, Secretary of Defense McNamara told President Johnson about the fighting and the naval mission in the area. On August 4, off the coast of North Vietnam, the Maddox thought that it was again under attack – in the dark of night. The Captain of the ship was to admit that it was just an "overeager sonarman" who "was hearing his ship's own propeller beat." But for two hours the Maddox and another destroyer, the USS Turner Joy, fired at imaginary targets. Air support from two US aircraft carriers was sent on a retaliatory mission against targets on Vietnam's coast. And President Johnson spoke to the America public about "deliberate attacks on US naval vessels." He said, "We must and shall honor our commitments." On August 6, Defense Secretary McNamara met with US legislators and gave them a distorted description of US naval activities in the Tonkin Gulf. On August 7 the Senate and House of Representatives passed the "Tonkin Gulf Resolution," characterized as a response to Communist aggression against US naval vessels. The swell of public opinion in support of a tough response against Communism was overwhelming, with only two US senators, Wayne Morse of Oregon and Ernest Gruening of Alaska, voting against it. It was 1964 and President Johnson was campaigning for the presidency against the Republican nominee Senator Barry Goldwater. Johnson said that he would not be sending American boys to do the fighting that Vietnamese boys should be doing. He won the election. Then in 1965 he continued to describe his opposition to North Vietnam invading South Vietnam. He characterized his policy as liberating South Vietnam from Communism. On 7 February the Viet Cong, or NLF, attacked an airbase, Pleiku, killing eight Americans, wounding 128 and damaging or destroying 24 American aircraft. Johnson retaliated by sending warplanes into North Vietnam, and the Soviet Union announced additional aid to the North. Twenty-three more US military personnel were killed on February 13. In March, the US launched Operation Rolling Thunder against North Vietnam. On March 25, China announced readiness to "send its personnel to fight together with the Vietnamese people to annihilate the American aggressors." In North Vietnam on April 2 a new military service law was decreed. Enlistments for soldiers were extended indefinitely, previously discharged soldiers were recalled, and an increased number of young people were inducted into military service. On May 16, Ho Chi Minh met with Mao Zedong and said that his nation would "take the main burden of the war by themselves," but he requested additional Chinese economic and military support, and Mao agreed. In mid-June, Under Secretary of State George Ball warned President Johnson that once he began escalating the war in Vietnam he would continue doing so until US troops reached maybe 500,000 in number. Secretary of Defense Robert McNamara described Ball's prediction as "outrageous." By the end of the month the first ground combat operation with US troops – the 173rd Airborne Division – took place. Most Americans were unaware of the historical complexities behind the conflict in Vietnam. They were supporting their president's policies and focusing on brutalities by the communist forces and what they saw as the "enemy's" attempt to expand communism. 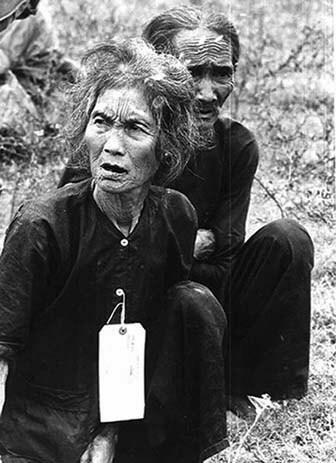 Those against the war focused on the bombing of people, the burning of people to death with napalm and warring against villagers who were supporting the Viet Cong. In front of the White House a common scene would be protesters chanting "Hey, hey, LBJ, how many kids did you kill today?" A division in US society was becoming more emotional and more intense.